Legends recount the tale of the princess who used to bathe in a scenic nook of the Khandepar River, a tributary of the Mandovi. After her bath, she would sit with her attendants, and drink a tumbler of sweetened milk. Once, on hearing voices in the woods, a prince stumbled upon the waterfall. To protect her modesty, the princess upturned the tumbler of milk and the water became milky and fell down as Dudhsagar (Ocean of Milk). The waterfall – India’s fifth highest – plummets 310 m off a lofty ridge bisected by a railway track and a scenic bridge! One of the most beautiful waterfalls in the Khasi Hills of Meghalaya, Nohkalikai drops from misty cliffs into an aquamarine pool. However, its natural beauty hides a sinister tale. In the village of Rangjirteh, from where the stream passes, there once lived a poor lady called Ka Likai. When she gave birth to a child, her husband passed away. In due course, she got married again. However, her new husband did not love the child and often got angry with Ka Likai for not taking proper care of him. One day when she was away to carry iron ore, he killed the child, cut the body into pieces and prepared a curry. He tossed the head and bones away but forgot to dispose the fingers he had hidden in the betelnut basket. When the lady returned and enquired about the child, the man said he had gone out to play and excused himself. She relished the rice and curry, thinking it to be meat from a sacrifice in the village. However when she reached for some betelnut, she stumbled upon the fingers. Letting out a terrible shriek, she grabbed her dao (machete), ran out and threw herself off the precipice. 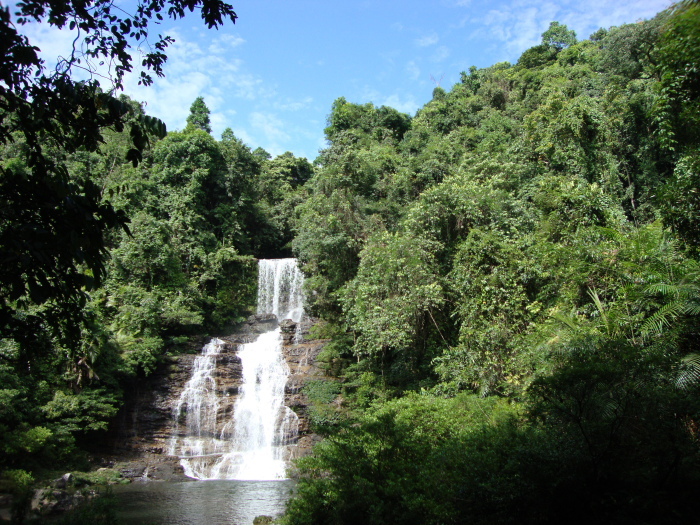 From that time, the waterfall was known as Noh Ka Likai or the Fall of Ka Likai. It is believed that in their conquest to Lanka, the brothers Rama and Lakshmana were crossing over the Brahmagiri Hills from Kodagu to Kerala. In a rare display of disobedience, Lakshmana felt a sudden surge of anger, returned his bow and arrows to his elder brother and stormed off. Oddly, the moment he stepped into Kodava land, his anger dissipated. Rama, walked up to Lakshmana, carrying a lump of earth from Kerala and explained that Kerala’s earth was Parashuram Kshetra, reclaimed by the sage after several bloody carnages against kshatriyas, and thus incited passions. Overcome by remorse, Lakshmana shot an arrow into the Brahmagiri mountain and threatened to fling himself into the flames that shot forth. Rama created the Lakshmana Teertha, extinguished the fire and blessed its waters with the power to absolve a person of his sins. Some believe it was Lakshmana’s tears of remorse that became the Lakshmana Teertha. Oddly, irpu in Sanskrit means ‘enemy’ – a place that made enemies even out of brothers. Even now, in Coorg when brothers fight, they ascribe it to this legend. After the Mahabharata war, the Pandavas renounced their kingdom and headed to the Himalayas to atone for all the bloodshed. At Dharali, the Pandavas took a bath in the river to remove the sin of hatya (murder) and thus the stream was called Hatyaharini. While going to Manasarovar, Bhima’s horse allegedly left its hoofmarks on a rock, which can be seen even today at Mukhwa. Locals believe that Bhima created a waterfall (Bhim nadi or Bhim Ganga) by shooting an arrow into the mountain to quench the thirst of the Pandavas. The niche where he supposedly rested a knee to take aim, still exists besides the image of a sleeping horse. Even today, cows and mules step into the same hoof prints while walking up the mountain. Village boys from Mukhwa often lead you to the jharna, where quartz stones, called moti patthar by the villagers due to their pearl colour, can be found around the waterfall. Access: Stay at Leisure Hotels’ Char Dham Camp at Dharali and cross the bridge on the Ganga to Mukhwa, from where the waterfall is a short hike away. It is believed that after separating from his wife Kaveri, Sage Agastya headed further south and climbed the loftiest mountain to meditate. Named Agasthiyar Malai, it is from the hill’s lofty heights that the Chittar River dashes down through roots and herbs as Kutralam Falls. Tagged as the Natural Spa of the South, (or Kuttralam Courtallam) Falls is the collective name for a diverse cluster of nine waterfalls. Peraruvi (Main Falls) plummets from a height of 120ft with people of all ages jostling for a good shower. In what appears like a mega community bathroom, fully clothed women cluster to the right, the elderly and children stay to the left and oiled men of all shapes and sizes brave the full force of the central torrent. The gentler Chittaruvi Falls is close by. Spreading like the hood of a five-headed serpent is Aintharuvi (Five Falls) 5km from the Main Falls with a shrine dedicated to Ayyanar Shastha. Around 6.5km from the Main Falls is Pazhaya Courtallam (Old Falls) with the ancient Thirukoortalanatheeshwara (Lord of the Peaks) shrine at the foothills. The conch-shaped temple has a stunning Chitra Sabha (one of the famous Pancha Sabhas) with beautiful mural paintings and wood carvings housing a Nataraja deity. A mile-long trek from Main Falls up the mountain leads to Shenbaga Devi Falls, after a temple nearby. Puckle’s Path, named after the District Collector who laid it in the 1860s, leads to Thenaruvi (Honey Falls), alluding to the honeycombs garlanding the overhanging rocks. Puliaruvi (Tiger Falls), once the watering hole of the big cats, has bathing ghats for pilgrims visiting the Pashupathi Shashta Temple. Pazhathota Aruvi (Fruit Garden Falls) near the Govt Horticulture Park above Five Falls is off-limits to the public. An hour’s drive from Courtallam past Shenkottai, Palaruvi (Milk Falls) plunges from the forests of Ariyankavu and offers a panoramic valley view. The best season is June to September and between November and January during north-eastern monsoons. Access: Located 5km from Tenkasi, it’s 167km south-west of Madurai via NH-208 on the Tenkasi–Shenkottai Road in Tirunelveli District. During the course of their exile, Rama and Lakshmana are supposed to have drifted down from Nashik and Mumbai down the Sahyadris. As they came to Saputara or the region of seven hills, like Banganga, they shot an arrow and created a spring. The twin streams of the Thoseghar Falls are known as Ram and Lakshman, though locals also refer to them as Mota Dhabdaba (big fall), which plummets 250 m in wide tiers and Chhota Dhabdaba (small fall), the three-ribboned stream to the right. However, it is water collected from the surrounding range of mountains Mahabaleshwar, Yavateshwar, Kas and Panchgani that forms this cataract and the origin of the Tarlee River. Access to the waterfall in monsoons is tricky due to slippery rocks and force of the water. A board with a list of lives lost in drowning accidents serves as ample warning. Access: Just 2km from the Himalayan retreat of McLeodganj lies the temple of Bhagsu nag and a short 20 min walk leads to the scenic 30 ft cascade. Perhaps no waterfall in India has been depicted in films as much as Athirapally. Kerala’s biggest fall has served as a backdrop for several songs in Tamil, Malayalam and Hindi cinema. A major portion of 1986 Tamil movie Punnagai Mannan, starring Kamal Hassan and Revathi was based and shot near the falls, leading to its popular nickname as Punnagai Mannan Falls. But the waterfall might as well have been named Mani Ratnam Falls, whose love for the location made him cast it not once, but again and again. It featured in his 1997 film Iruvar starring Mohanlal and Aishwarya Rai, the 1998 film Dil Se with Shahrukh Khan and Manisha Koirala, the 2007 Guru with Abhishek Bachchan and Aishwarya Rai and then again in 2010 in Raavan (Raavanan in Tamil). Such is Athirapally’s popularity that nearly 7 million tourists visit the falls and nearby Vazhachal annually. Access: 30 km from Chalakudi, 55km from Kochi Airport and 58km from Thrissur. Stay at Rainforest Athirapally with waterfall views from every room. Authors: Anurag Mallick & Priya Ganapathy. This article was the cover story for the July 2014 issue of JetWings International magazine. At Shillong, the air was crisp and cold with rock music riding the wind, wafting out of street cafés and mobile phones. The 3½ hour drive from the plains of Guwahati to the mountainous expanse of Meghalaya was mesmerizing. Every so often, we’d stop to click old churches, charming colonial bungalows and women in traditional jainsen and blouses. Near the Polo Ground we watched men wager at the age-old game of teer (archery) before digging into delicious Khasi cuisine of jadoh (red rice) and pork in Trattoria, a local joint. Our base Rosaville was an elegant heritage home in the suburbs, adorned with antique furniture and sepia photos. Over tea and cookies our hostess Trupti Bauri delighted us with stories of burrasahibs and colonial history. The Don Bosco Museum was an eye-opener on the cultural uniqueness of the North East. We hopped over to the privately-owned Butterfly Museum at Riatsamthiah nearby. Run by the Wankhars, SK Sircar’s splendid one-man-collection showcased a brilliant array of butterflies, beetles and moths. The Rhino Heritage Museum, once an ammo store and dungeon for Japanese POWs in WWII, offered glimpses of the Indian Army’s achievements. We drove 10km to reach Shyllong Peak for a fantastic view of the East Khasi countryside. Vendors selling farm produce along the road startled us with the size of radish – each, an arm’s length and as thick as a dictionary! 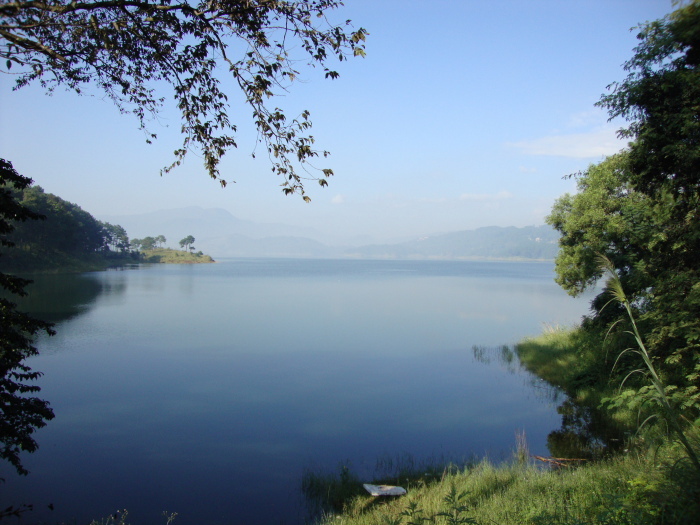 About 15km north, the rippling Umiam Lake (Bara Pani) was the scenic setting for the plush Ri Kynjai Resort, a delicate fusion of luxury and tranquility. On a whim we took a bus to Smit, 17km south of Shillong, the cultural seat and royal abode of the Khyrim Syiemship. The thatched wood and bamboo Lyngdoh House was a study in traditional architecture while a massive granary stood as a nostalgic remnant of a prosperous past. In the quiet untouched sacred groves of Mawphlang, conservationist Tambor Lyngdoh shared insights about endemic flora and Khasi animist traditions. Back in town, the quaint horseshoe-shaped gate of Tripura Castle drew us into the erstwhile summer retreat of Tripura’s Manikya dynasty. Built in the 1920s by Maharaj Bir Bikram, it was renovated in 2003 into the first heritage hotel in the North East! Swaddled in luxury, we mulled over our next move when a chance meeting with Deepak Laloo of Nakliar Tours led us to Meghalaya’s best kept secret. Mawlynnong. We rolled the word on our tongues like a toffee, savouring its musical lilt. Was it really Asia’s cleanest village? The winding journey from Shillong to Dawki would tell us. We sped past open meadows where grass glinted like polished gold in the slanting sun. By dusk, we reached the quaint village with neat rows of houses peeping over floral hedges. 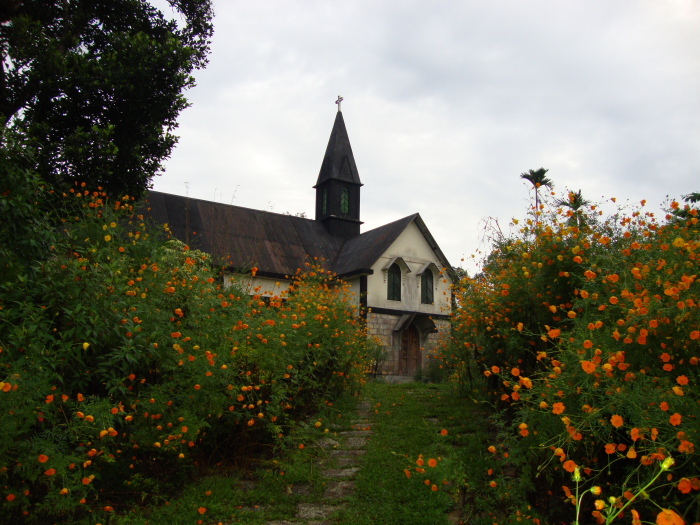 Bright orange cosmos bobbed in greeting as Henry Kharrymba led us beyond the Balang Presbyterian Church and a rickety bamboo bridge to the Mawlynnong Guest House & Machan. Like baboons in a leafy canopy, we chattered in the balcony, sipping black tea listening to the stream murmuring below. By morning Mawlynnong looked like a fairytale. Gardens were awash with dewdrops and the village road was clean as a whistle. Was it coincidence that the fields were lush with broom grass or Phool Jhadu (Thysanolaena maxima), which spawned Mawlynnong’s broom-making industry? Each home had a woven basket for trash and everyone from the elderly to elfin children ensured that the town lived up to its tag ‘God’s Own Garden’. Patting a boulder, Henry said “This hole is caused by rainwater. We call it ‘maw-lynnong’ in Khasi, meaning ‘stone with a cavity’ which gives the village its name.” Stones play a significant part in Khasi culture. Some homes had Maw-bin-nah, monolithic stones honouring their ancestors. Perched on a stone with the improbability of an elephant sitting on a lemon, the sacred Maw Ryngkew Sharatia or Balancing Rock was an ancient Khasi shrine that pre-dated the advent of Christianity. The 2km walk to Riwai’s Jing Kieng Jri led to a setting reminiscent of the movie Avatar. 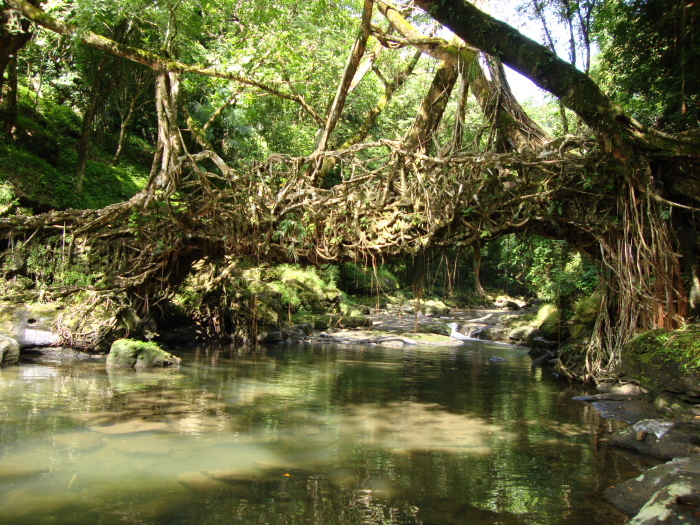 A stunning natural bridge created by gnarled roots of the Ficus elastica tree swung over a rivulet. 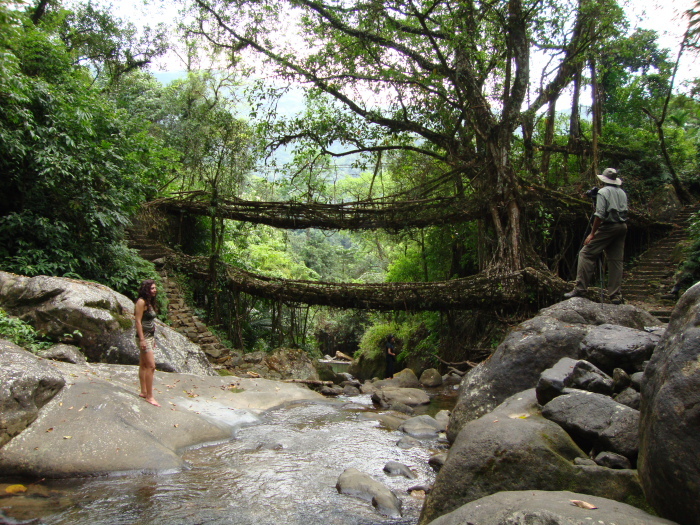 In Meghalaya’s remote hill tracts, the Living Root Bridges are centuries old modes of crossing streams. Nurtured by villagers who diligently twirl new wiry tendrils around older ones, the intricate hardy mesh can even be paved with stones! 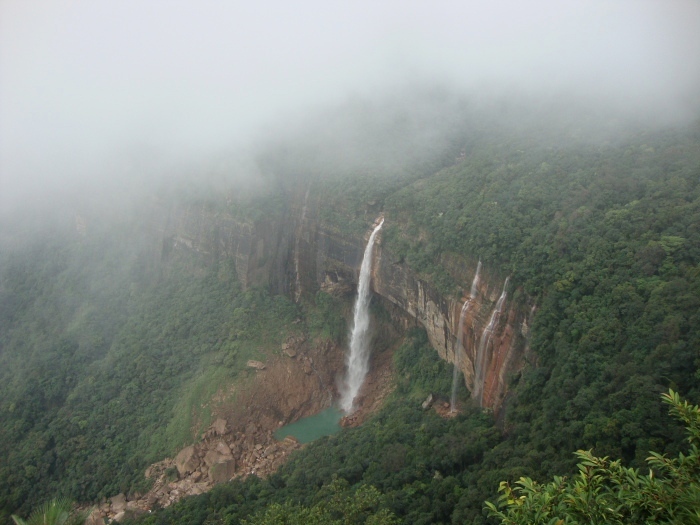 But no trip to Meghalaya would be complete without halting at Sohra or Cherrapunjee, one of the wettest places on planet earth. In this rain-soaked haven adrift with clouds, nature lovers come to track the Dark-rumped Swift diving along the misty gorges of the magnificent Nohkalikai and Nohsngithiang Falls and admire the limestone formations of Mawsmai and Mawsynram caves. 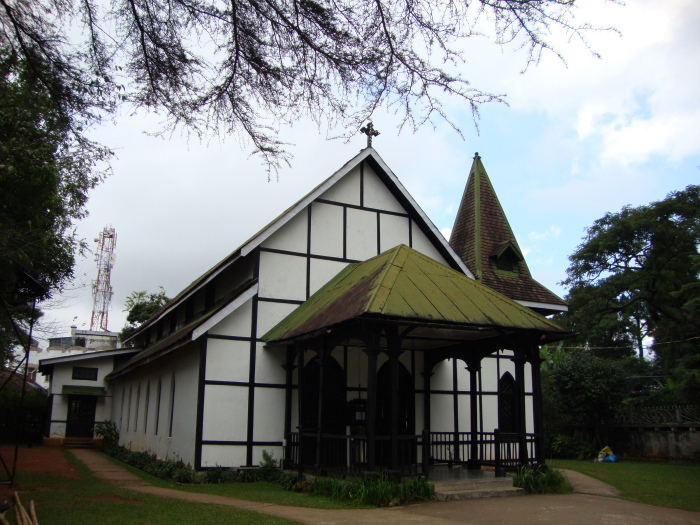 Being the first British foothold in the North East, relics of Sohra’s imperial past lay scattered around the countryside – the David Scott Memorial (1831) and Nongsawlia Presbyterian Church built in 1846. At Cherrapunjee Resort, our host Dennis Rayen revealed that bouldering and caving were gaining popularity. His passion for the place was evident. He had painstakingly collated meteorological data and decorated his walls with charts indicating how Mawsynram had dethroned Cherrapunjee as the world’s rainiest place! Authors: Anurag Mallick & Priya Ganapathy. This article was published on 18 May 2013 in Times Crest newspaper.